Happy Wellness Wednesday my friends! “Nooch” is slang for nutritional yeast. I honestly have only known about nooch for a few months and I am low key upset I have not had it before! It is one of my new favorite ingredients. You can put it on your pasta (mac and cheese is yummy), salads, CORN, kale chips, gravy, mashed potatoes, french fries, bean dip, and even on your pizza. It is a great vegan/vegetarian option and is a nutrient powerhouse in my eyes. Low in sodium, 3g protein per serving, 20 kcal/serving and GF…it makes for a perfect cheese alternative. Have you tried Nutritional yeast yet? It is a nutritional powerhouse and fun to use as "cheese" for a vegan option! Bring a large pot of water to a rolling boil. 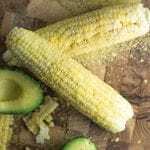 Remove corn husk and drop corn in boiling water for 8 minutes. Drain and let cool down for a few minutes before adding toppings. 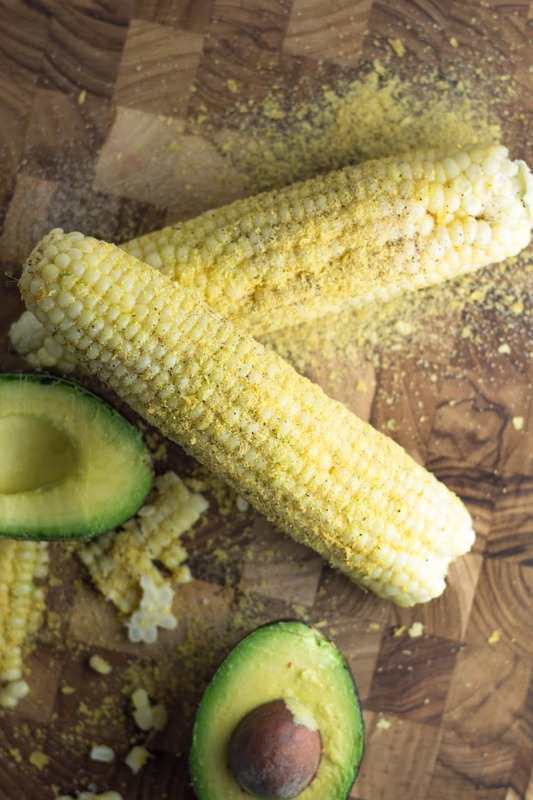 Rub the avocado on the corn. The avocado is acting as the butter agent. Then sprinkle the garlic powder, nutritional yeast and then the pepper. Enjoy! Yay! I love nutritional yeast! Fun idea to add it to corn on the cob! haha you are too funny!! Yes – pasta, salads, chips, popcorn, kale chips…endless options!! 🙂 Thank you! Ohhh nutritional yeast on everything is amazing! It is so addictive but on Corn on the Cob I have NOT tried this!! and I definitely NEED too!!!! Totally agree – yes do try, hope you like it! !